Algae may not always look exciting, but this extremely diverse group has a lot of secrets. We are only just beginning to piece together the evolutionary history of these organisms, some of which are not even classified as plants. All algae contain plastids that appear to have been derived from an ancient endosymbiosis between a non-photosynthetic host cell and a photosynthetic cyanobacterium, but since then these species have undergone a complex evolutionary history that blurs our understanding of how their genes and metabolic networks are related. Caloglossa beccarii, an alga in the genus Caloglossa, which is known for producing mannitol. Image credit: Eckhard Voelcker. Used with permission, all rights reserved. Mannitol is a naturally occurring polyol produced by a wide range of organisms to protect against environmental stress, including plants, algae, fungi, yeast and bacteria. While it isn’t produced by animals, mannitol is often used in medicine as a treatment for increased pressure in the brain and eye, as well as a sweetener in foods for diabetic people. Mannitol is a polyol, meaning it contains multiple hydroxyl groups. Image credit: Tonon et al. (2016), New Phytologist. Plants and algae produce mannitol from fructose-6-phosphate, taking two different approaches to get the job done. In plants, the conversion is a three-step process with mannose-6-phosphate as an intermediate, but algae split it into two stages, reducing fructose-6-phosphate into mannitol-1-phosphate (M1P) using the enzyme mannitol-1-phosphate dehydrogenase (M1PDH), then hydrolysing M1P to mannitol using mannitol-1-phosphatase (M1Pase). The activity of these enzymes has been detected in many lineages of algae, but the genes encoding them have not been identified in the vast majority of species. Mannitol can comprise up to 25% of algal dry matter, so understanding how these organisms manufacture it could lead to improved production rates of this useful compound. Thierry Tonon and colleagues from the University of York took on this challenge, assessing the presence of known mannitol biosynthetic enzymes across a wide range of algae species. 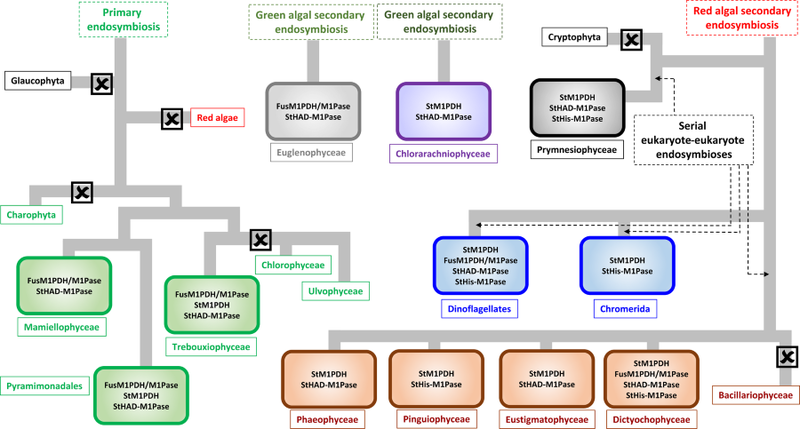 In their Letter, published in New Phytologist, they report on the unexpected diversity in algal mannitol biosynthesis pathways and the complex evolutionary histories that gave rise to them. Tonon and colleagues searched algal genomes and transcriptomes using mannitol biosynthesis protein sequences from the brown alga Ectocarpus and the apicomplexa Eimeria tenella (the apicomplexa are a group of obligate parasitic protists which have evolved from a photosynthetic ancestor). While Ectocarpus and Eimeria both have similar M1PDH enzymes, they use two different types of M1Pases: haloacid dehalogenase (HAD-M1Pase) or histidine phosphatase (His-M1Pase) respectively. 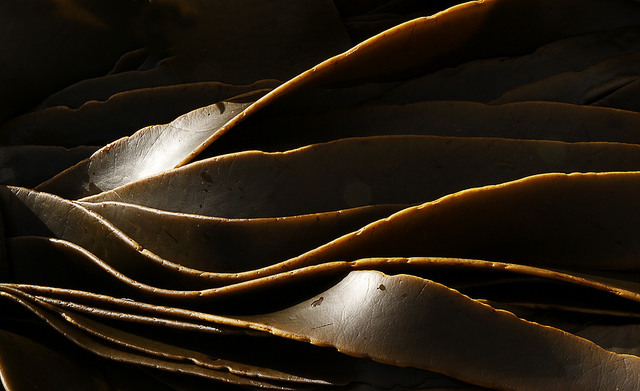 Kelp is a member of brown algae (Phaeophyceae), which has stand-alone M1PDH and HAD-M1Pase enzymes. Image credit: Bernard Spragg. Image available in the public domain. Investigating the presence of mannitol biosynthesis genes revealed complex evolutionary histories of mannitol production throughout the algae. Modern cyanobacteria are not able to produce mannitol, so genes encoding M1PDH and M1Pase could have been present in the non-photosynthetic host cell before the ancient primary endosymbiotic event that led to the algal lineages. Various lineages have since lost these genes or evolved variants through gene duplication and diversification. In many species, M1PDH had fused with one of the M1Pases to create a bi-functional enzyme potentially performing both steps of algal mannitol production. Interestingly, some algae contained both a fused enzyme and one or more stand-alone enzymes, with some species possessing several enzymes that could perform the same biosynthesis activity. It isn’t clear yet whether this functional redundancy is important for the physiology of the algae involved, but it does help us to piece together the evolutionary spread of mannitol production through the algal lineages. The complicated evolutionary history of mannitol biosynthesis in the algae. X indicates a loss of mannitol biosynthesis genes. The prefix ‘St’ indicates stand-alone proteins and ‘Fus’ for bi‐functional M1PDH/M1Pase fusions. Image credit: Tonon et al. (2016), New Phytologist. One of the most interesting things this study revealed was the possible transfer of mannitol biosynthesis genes between algal species. Many biologists are aware that bacteria can pass genetic material to other individuals without mating, rapidly spreading useful traits such as antibiotic resistance through a population. 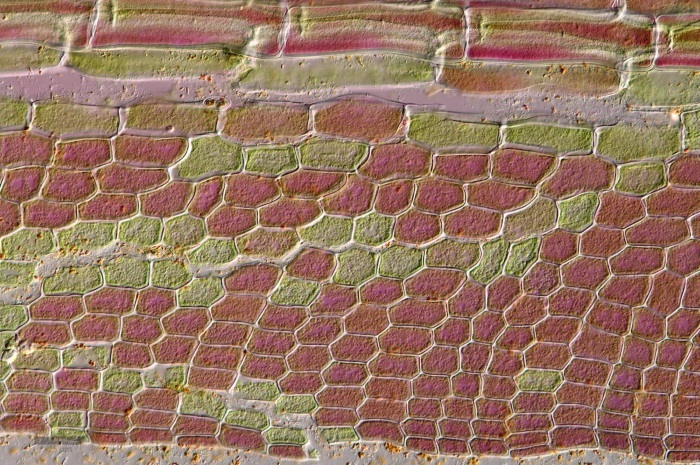 Despite their greater level of complexity, horizontal gene transfer can also occur between eukaryotes such as algae, allowing some lineages to collect multiple variations of the mannitol biosynthesis enzymes. Tonon and colleagues have provided us with a much greater understanding of mannitol metabolism evolution in the algae, opening up many new avenues for research. It raises some interesting questions; why do some algae have many different mannitol biosynthesis enzymes, often predicted to be separated in different cellular compartments; how did these diverse mannitol biosynthesis pathways evolve in different species; and what is their ecological and physiological importance? The authors conclude that this knowledge could be particularly useful for enhancing our understanding of carbon cycling in aquatic environments in the era of Oceans Systems Biology. This entry was posted in Latest Posts, New Phytologist and tagged algae, evolution, haloacid dehalogenase, histidine phosphatase, mannitol, mannitol biosynthesis, mannitol-1-phosphatase, mannitol-1-phosphate dehydrogenase, metabolic pathways, New Phytologist, plant science, primary metabolism. Bookmark the permalink.